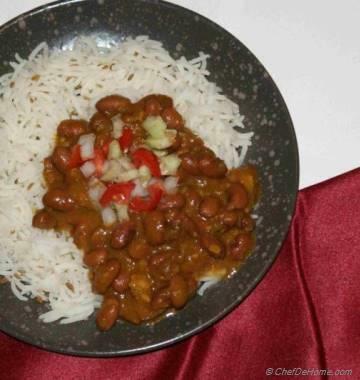 Winters come with opportunity to get cozy and lazy with a bowl of warm soup in hand. 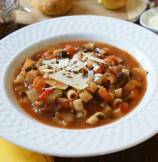 How about a bowl of healthy, wholesome and delicious Minestrone Soup with Pasta? 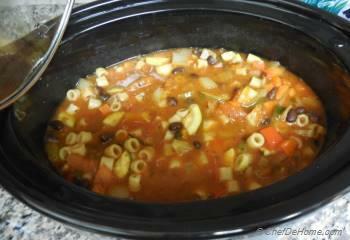 Crock-pot Minestrone Soup is my favorite vegetarian side-soup whenever we eat at Italian Restaurants. 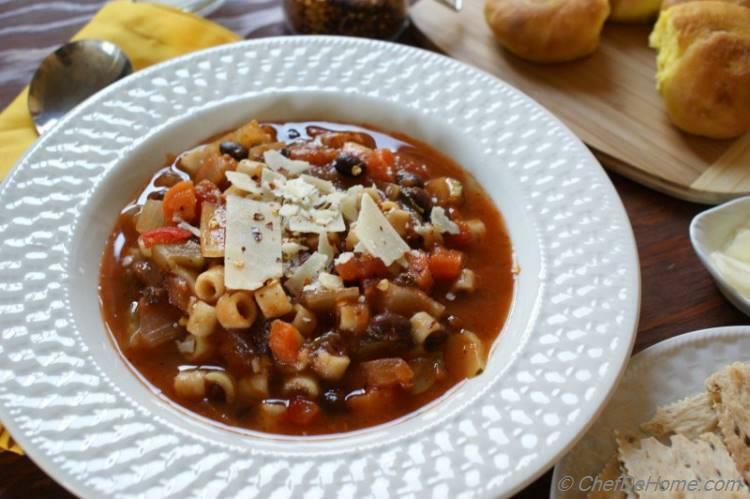 But at home, I often prefer to cook minestrone with pasta for a complete one pot dinner with some Italian country-style bread on the side - The best opportunity to snuggle with bowl of soup and cook nothing else. My slow cooked minestrone helps me get even more lazy. Just assemble and switch on the cooker. Soup will be ready low and slow in about 6 hrs. 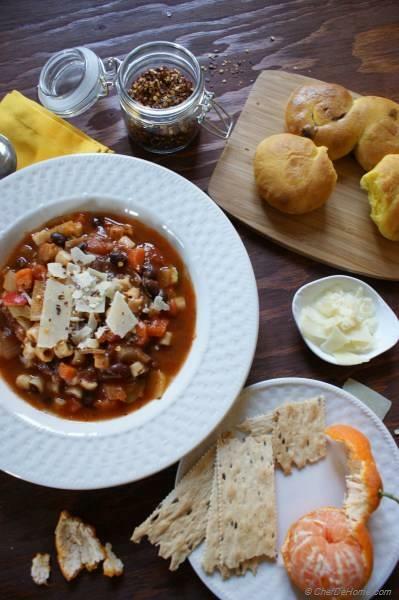 Come from work, just grab your favorite comfy seat at home and enjoy warm soup with crusty Italian bread. 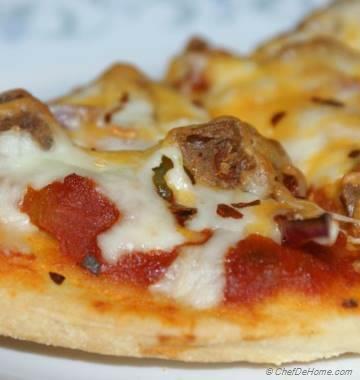 A perfect week-night dinner idea!! 1. Prep - Slice and dice all vegetables except zucchini and bell pepper. 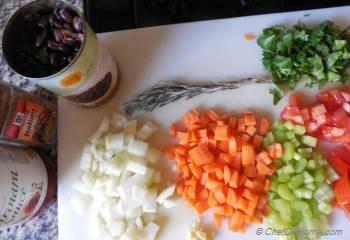 Also rinse the black beans under running water. 2. 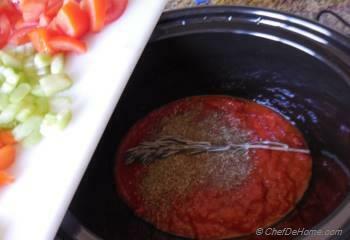 In a crock pot, combine tomatoes, marinara (or canned tomato if using). 3. 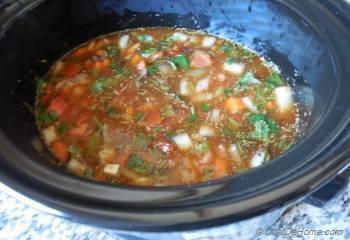 Add beans, garlic, carrots, celery, onion, rosemary, Italian seasoning, parsley and vegetable stock with 1/2 cup water, salt and pepper. Cover and cook on low for 6 hours. 4. Forty Five minutes before the soup is done cooking, add small diced zucchini and bell pepper and uncooked pasta, cover and complete cooking on high. Remove rosemary sprig. Season to taste with salt. 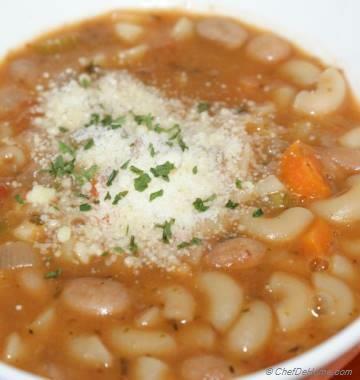 Ladle soup into bowls and top with parmesan cheese and serve with some crusty bread on the side.